After the fantastic announcement last week that the UWEBARS team of Jordan Cormack, Tom Hodson, Stephen Hartless, Oliver Haward, and Jack Lewis (shown above, l-r) are the 2017-2018 winners of the National Rocketry Championship, we’re delighted to share this guest post from Jordan about their achievements, the challenges they faced and what the future may hold. During the final year of the MEng Aerospace Engineering course at UWE there is a group project module, which provides teams of students with the opportunity to apply their knowledge on a more substantial engineering problem. 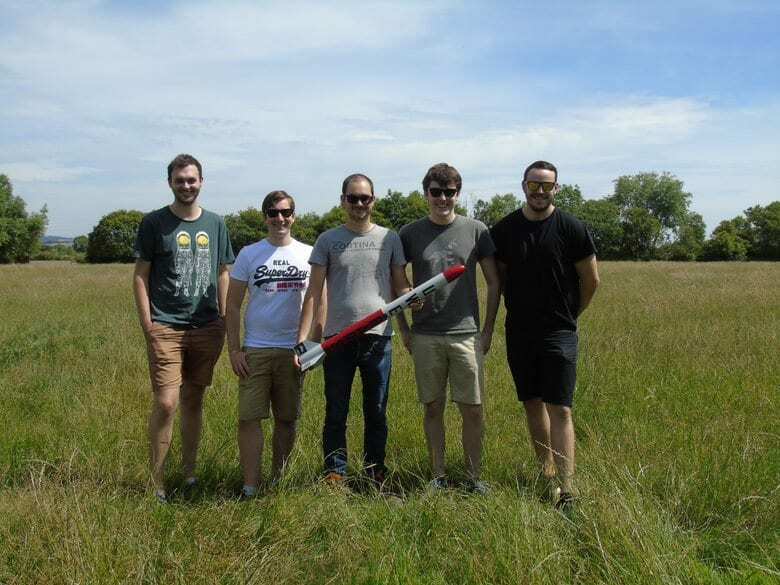 Our project aim was to explore the feasibility of developing a ‘rockoon’ launch solution for small satellites, using commercially available components at a university level. A rockoon (derived from rocket and balloon) is a rocket which uses a high altitude balloon to reach the upper atmosphere prior to launch. The rationale for this approach is to bypass the region of the atmosphere where a rocket experiences the greatest aerodynamic forces, offering a more efficient deployment solution for small satellites into space. Many recent studies on rockoons at a university level have been limited to purely theoretical studies, with practical demonstrations only being performed by large private companies. 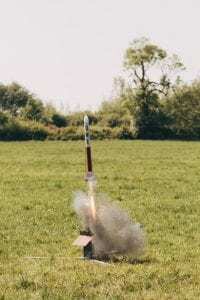 The demonstrator rocket which was developed during the project was designed in compliance with the UKSEDS National Rocketry Championship requirements. 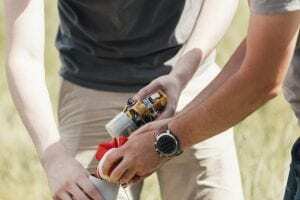 This yearly competition challenges student teams to design, build and launch rockets with a primary goal of reaching the highest possible altitude, with a limited rocket motor selection. Although a balloon assisted launch is not allowed under the competition rules, designing our rocket to enter the competition allowed us to test our avionics and on-board systems before a balloon launch, and ensure UWE had an annual presence in the competition. Commercial off-the-shelf parts were chosen for the fuselage and nose cone of the rocket. The base of the rocket, consisting of the fins and motor mount as a single part, was 3D printed and ensured that the fins and motor mount were aligned correctly, whilst also improving aerodynamic performance. A prediction of the rocket performance was performed using Microsoft Excel and OpenRocket, with the drag coefficient validated using Computational Fluid Dynamics (CFD) (using computers to simulate realistic flows). Alongside the rocket development, a balloon flight prediction tool was developed to calculate the ascent of the balloon to the target altitude (around 32 km or 105,000 ft) using the computer program MATLAB. Weather data were also used in the prediction tool to estimate the path of the balloon due to the wind. The payload for the rocket was based around an Arduino Nano (a microcontroller board – a very small computer), connected to a suite of sensors to measure pressure, acceleration, orientation and GPS location throughout the flight. This was logged on-board to a microSD card as well as transmitted live to a ground station using a 433MHz Radio Frequency (RF) link. During parts of an ascent to over 100,000 ft, temperatures can fall below -50 °C, well below the operating limits for the electrical components we were using. Low temperature testing was conducted with these components at UWE to identify suitable materials to house the on-board systems and protect them from the cold temperatures during the flight. In the UK, high altitude balloon flights require approval from the Civil Aviation Authority (CAA), requiring operators to declare their launch date, location, size of balloon and payload. 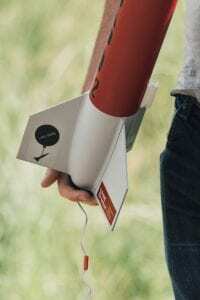 The CAA do not currently have an approval process in place for launching a rocket from a high altitude balloon. In the second half of the year, we realised that although a high altitude balloon launch was feasible for a university team, the time and budget we had for the project would not allow for this on top of the complete development of the rocket and flight systems from scratch. This meant our focus was shifted from a rockoon launch to the UKSEDS launch, which would validate our rocket design and on-board systems for other teams to take forward, with the potential for a high altitude balloon launch in a future project. 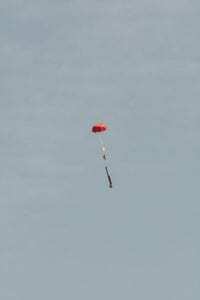 We carried out an initial rocket launch test which showed a successful launch of the rocket and of the parachute recovery system. 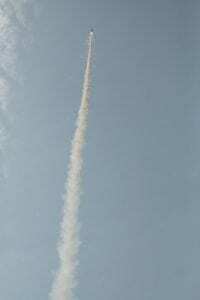 The altitude was calculated using two different pressure sensors to be just over 560 m. The launch also demonstrated that the live RF communication system worked well, achieving a transmission success rate of over 98% during the rocket ascent. Although this test was successful in many ways, we continued development of the rocket design and systems for a second launch. This launch also allowed us to compare the predicted flight performance with the actual flight. A new fin assembly was 3D printed with removable fins, and a custom nose cone was also produced to allow for the integration of a greater number of sensors such as GPS. The second rocket was manufactured and later launched on the 23rd of June at FOG Rocketry in South Wales. This second flight also featured a UKSEDS supplied altimeter as a validation for the competition. The second launch was a success, but the nose of the rocket separated from the fuselage when the parachute was deployed. The payload was recovered however and all recorded data was intact. The highest altitude recorded by the UKSEDS supplied altimeter during this launch was 539 m, showing that our on-board altitude measurements of 539.06 m for the pressure sensor and 538.95 m using the GPS were accurate. Alongside the university report and VIVA, a build & design report and launch report were produced and submitted to the UKSEDS as part of the competition requirement. (Please be aware the video below may be loud!). On 17th October the UKSEDS announced us as winners of the National Rocketry Championship for 2017-18, highlighting our 3D printed fin assembly and on-board verification of altitude using a barometer and GPS. As well as our success with the UKSEDS competition, we were chosen to display our project as part of the 2018 UWE Faculty of Environment and Technology Degree show where many industry representatives took interest in the project and we were awarded the Best Group Project Prize for the 2017-18 academic year. Overall the project allowed us to work as a team to develop a complete rocket system with additional knowledge and testing carried out in preparation for future flights including a potential balloon assisted launch. Following our project, two groups have already started work on further developments for the new academic year. For more information, please contact Jordan: jordan.cormack@uwe.ac.uk. Emerging tech researchers: Are you losing funding opportunities by not engaging in interdisciplinary research?